When you are drunk and on Bui Vien (and you will be) you will eat here. When you are sober and on Bui Vien you will not eat here. Its about as simple as that. Just average kebab, “good” if you’re drunk and in the area. Nothing exciting about it, maybe except it’s quite cheap. Definitely not suitable for a real foodie. Close but .. Well almost. This is a very small stand. The guy makes it very quick. The bread was thicker than usual and not so much meat. The effect was too bready. The sauce was good and it sort of hit the spot. The so called kebab is VND 30,000 that is alright for the food experience available, and anyway it comes fast if you are hungry and in hurry. This is a small Vietnamese stand that tries to make doner kebab :) The meat is so so. But if you are looking for a quick cheap bite and a beer while watching the crowd, it's a good option. 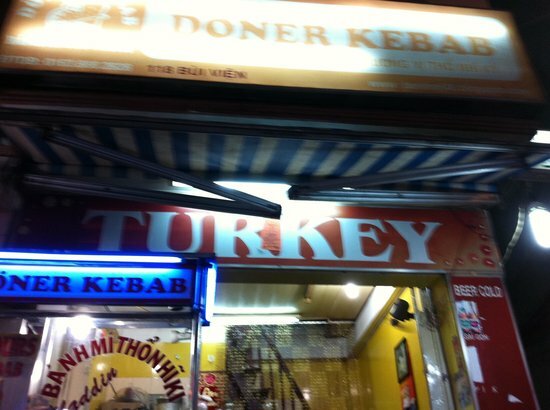 Great kebabs for really cheap along the backpacker strip. This is great drunk food and food on the go for when you are moving along bui vien from bar to bar. We always take a bag of doner kebabs with us when we pile in the car for the trip back to Saigon from Mui Ne. They are tasty and inexpensive - some of the best food available in Mui Ne. Get quick answers from Doner kebab staff and past visitors.